Changer's first single on Flux Delux channels the spirit of the roaming plains of the Serengeti and beyond with his intelligent and enthusiastic approach to dance. "I try to create my own worlds" says Michal aka Changer, "I invite listeners to explore with beautiful sounds". 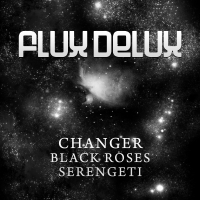 Beautiful indeed, with this two-track single, Changer first creates an all-encompassing epic with 'Black Roses'. With its stringent chord-line throughout, he evokes images of wild animals finding shelter under a blistering sun. The sun will always set however and second-track 'Serengeti' is driven by the idea of contrast when night sets in. Bringing together tribal-chants and an incredible bassline - Changer really seeks to unite the natural and modern together in perfect harmony. 'Black Roses / Serengeti' is available now from Beatport and iTunes.